The next Cactus Car Modelers meeting will be held on the second Wednesday of the month at 7:00 pm. Please see the 2017 – 2018 Meetings page for full information. Members: Check your roster for address & contact phone info for the Host of any meeting. He’s back! Danno Baker slipped back into the Winner’s Circle by extinguishing a lot of hot competition (yeah, right) in this group of pre-1970 police, fire, and ambulance emergency vehicles. 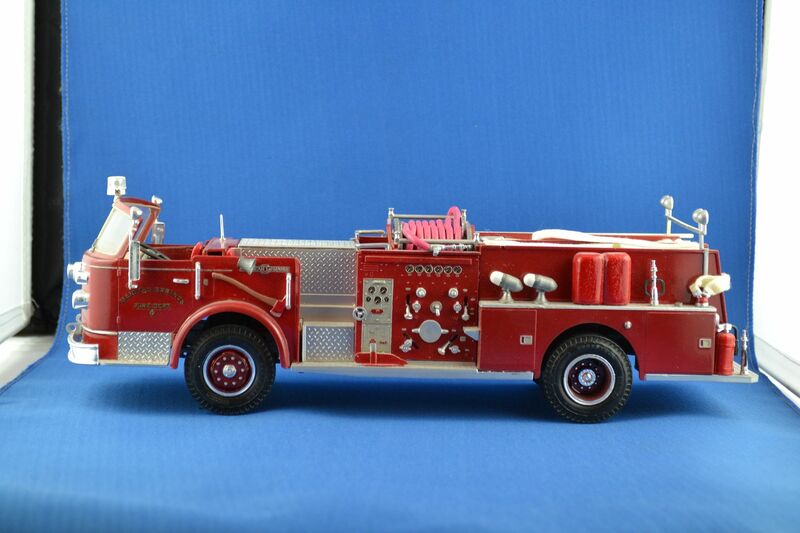 His 1969 American LaFrance Century-Series open cab pumper was a modified AMT kit with scratchbuilt tools, accessories, and features. It replicated the first fire engine he served on as a firefighter. Of course, the intrepid Lanny Haas had to take the Heavy Commercial theme and make it all about old school racing, right? Indeed. His rendition of the Wood Brothers Racing Team’s road going rig snagged yet another Winners’ Circle notch for his rather chopped up belt! Once again smoking past the huddled competitors to cop another Winners’ Circle appearance, Lanny Haas showed up and laid down a terrific old school rail dragster, complete with a trailer ride and period tow-vehicle. Outstanding, clean workmanship as always carried the day for this gem. Welcome back [to the Winners’ Circle], Kotter! Yes, Virginia, Cadillac did make race cars. And, Cadillac did race them at LeMans. When the club’s ‘Cadillacs’ theme came along, no one expected to see a Caddy racer on the table. Enter Bernie Kankiewicz with just such an off-the-beaten-path entry as an excellently executed circle-burner! Lanny Haas elbowed his way back into the Winners’ Circle with this nifty ’57 Ford convertible NASCAR replica, replete with all the right details, showing everyone how it’s done. And how it was done in the darksider days. Not to be left out, Bernie Kankiewicz roared into the Winners’ Circle with a gorgeous little Midget racer to ‘sack’ everyone else. And, yes, it is . . . pink! Painstakingly constructed from the tiny parts of the recent Revell kit, it looked every bit the part . . . if your eyes were good enough to something that small! Yep, this roundy-rounder is 1/25th scale. It’s small because . . . well, they were midgets. Whoa! It’s been a long time since we’ve seen this guy in the Winners’ Circle! Dan Baker’s odd little “PT Ute” took the honors with its flamed Brick Pearl finish, real wood pick up bed, and “camino” styling. Try to resist the urge to call it a cute ute.